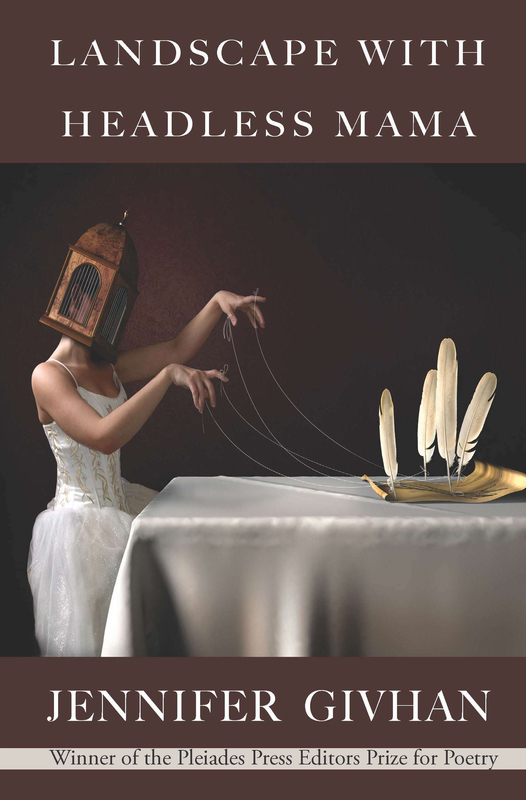 Jennifer Givhan’s Landscape with Headless Mama, winner of the Pleiades Press Editor’s Prize for poetry, is a haunting fairy tale of watching, desiring and obtaining motherhood. Givhan’s poems combine both the visceral with the otherworldly, the every day with the legendary. Her poems are as real as they are magical, as grounded as they are inventive. In Landscape, Givhan portrays motherhood as a surreal journey where definitions of life and body are subverted. Givhan begins Landscape with a quote from Audrey Niffeneggar: “In fairy tales it’s always the children who have the fine adventures. The mothers have to stay at home & wait...” However, Givhan transforms this trope and makes the mother the central figure to her fairy tales—who is not only an active participant in the story, but a vital guide for primary speaker in the poems, the daughter. The mama, the main mother figure in the poems, serves as both model and affirmer, passing down the inheritance of motherhood to the daughter. The fairy tale of motherhood starts with the foreshadowing of the mother’s death. In “Karaoke Night at the Asylum,” the mama is “already coffin-legged.” The speaker is already “a gravedigger.” We enter this fairy tale knowing and expecting death to come. And death does come. In the sequential poem “A Crown for Headless Mama in Her 14×14 Music Box,” we see God pasting together cremated bodies, art demanding “we’re alive,” and the speaker’s daughter taking part in her own gravedigging: all embodying the desire, yet failure, to bring life to the lifeless. Givhan writes: “Not through... cranes strung together like Japanese / resurrection kites can she possibly / bring back Mama.” While the speaker cannot physically bring back the mama, she uses storytelling to resurrect her mama into the mythological Headless Mama, who is able to go as she pleases, leaving only her body behind. This mama is a spirit that visits the speaker, and inhabits and transforms the definitions and roles of motherhood that the speaker explores throughout the book. The mama isn’t the only character in these poems though—she stands in a pantheon of mamas, including: the Aztec goddess Coaticue (comforter, creator mama), an octopus (mama who carries on), Frida Kahlo (mama in conversation), Schrodinger’s Cat (the mama of possibilities), and a spider (toxic mama). Throughout the book, the speaker consults these mamas to cope with her own mother’s death, and to receive advice on mothering. A thread that runs throughout these poems that connects the mother and daughter is not only their blood relation but their similar battles with their bodies. We get hints of the illness that strikes the mama, as well as an illness that strikes the speaker. In “Tattoo,” the speaker says: “never trust a body, I imagine Christ said to his fishermen & his mama from the cross.” In this fairy tale, the body is the villain. The speaker particularly wrestles the body when it comes to miscarriage—largely in the section titled “Innerscape (The Miscarrying Artist).” This fear of being unable to carry life is manifested through the repeating imagery of eggs. In the poem “The Eggs,” neighborhood children begin disappearing, only to be replaced with eggs. We are constantly reminded of the potential for life. What is so powerful about this section is that through these images, Givhan not only tells the story of a painful experience, but universalizes and makes it tangible for the reader. Givhan takes an experience that is personal and intimate and expands it through placing it into the realms of mythology and science. This combination seems bizarre at first, but through both of these mediums, Givhan recreates the sensation of losing and looking for faith. In the poem Insemination, Givhan writes: “now fractured & borderless I cling to hope that a pair of latex gloves & catheter will raise from the dead what nature buried...I pray to science.” In studying the octopus in “Miscarriage through Animal Science,” the speaker asks: “What is it like to be an octopus? What I’m asking is how we carry on.” By placing this experience into larger realms, Givhan goes beyond the literal world of a miscarriage and recreates the images and emotions behind a miscarriage, which made it so incredibly powerful and hauntingly relatable. While the speaker wrestles with the body throughout these poems, she concludes in Bird Woman that the “body is a slave.” Likewise, the mama’s life is not bound to her physical death: the spirit of the mama is not exclusive to a physical body. Even when the mama is dead, she is still present and alive in the speaker’s life. She inhabits the speaker’s physical inheritance, as well as the mythologies, archetypes, legends and memories of the speaker. These poems, like the phoenix, create a lifecycle that begins in birth, goes through life and death, and then resurrects to a different kind of life. This book carries the spirit of the Day of the Dead, where the dead and living are full of energy and brightly colored in the same room. In Landscape with Headless Mama, Givhan isn’t afraid to get uncomfortable, to break open definitions of motherhood, acknowledge her own vulnerabilities, and say the things we often silence. Even when the speaker does inherit motherhood, she wrestles with her own title as mother. In “I’ve Carried an Elephant,” she says: “What of selfishness can I speak? —the way I wanted desperately to become a mother & believed the burden was mine.” This vulnerability is particularly clear when describing the adoption of her son. In “Adoption Papers,” the speaker calls her son “her boy-turned-my-boy,” and says: “I feel like a body snatcher.” She talks openly about his birth mother, and shows her son’s fear of what to say to his birth mother, as well as his desire to run away to her. She is unfamiliar to him, yet also intrinsically connected to him. The speaker acknowledges her own need of the birth mother—the two are connected in a way almost reminiscent of the painting “The Two Fridas.” In “Jeremiah Growing,” the birth mother, on passing her son to the speaker, says “we’re bound for life.” In “Adoption Papers,” the speaker says “I was almost sure I needed her / watching the empty sky with us.” But as the book progresses, her son is just “my son” and the haunting of the birth mother is replaced with the return of the speaker’s mother. Meg Eden’s work has been published in various magazines, including Rattle, Drunken Boat, Poet Lore, RHINO and Gargoyle. She teaches creative writing at the University of Maryland. She has five poetry chapbooks, and her novel “Post-High School Reality Quest” is published with California Coldblood, an imprint of Rare Bird Books. Find her online at www.megedenbooks.com or on Twitter at @ConfusedNarwhal.